The Fukushima wastewater contamination issue is of concern to everyone. The following is the most recent data concerning groundwater, inner harbor, outer harbor, and open sea activity levels associated with Fukushima Daiichi. The links include the latest readings at all sampling points and graphics depicting sampling locations. We will post future updates on these readings as they become available. 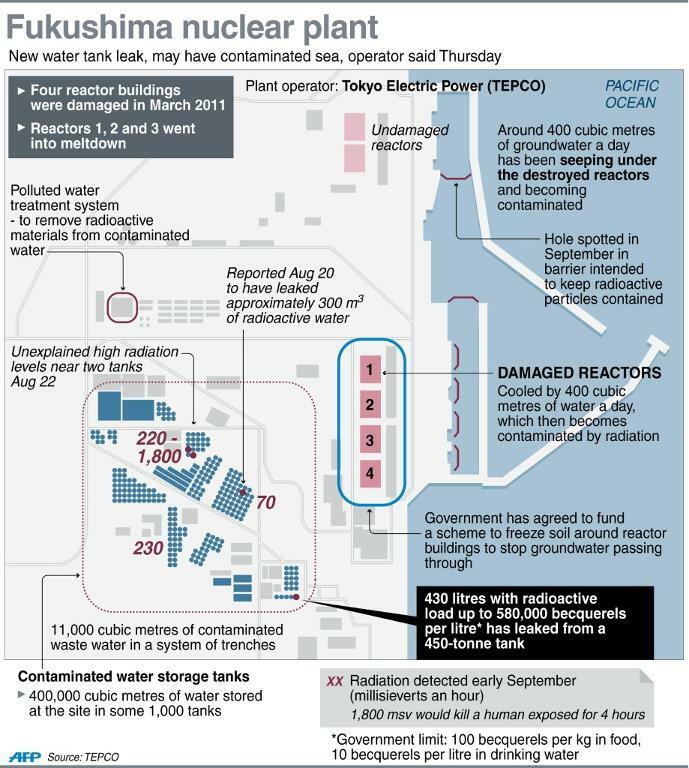 One of the Fukushima tanks receiving low-contamination rainwater has overflowed. Most of the water seems to have fallen inside the foot-high coffer dam surrounding the five tank group. But, because the tanks are located on a slight incline and the problem one is the last in line, some of the overflow fell outside the dam. Tepco tests on the water inside the dam revealed about 200,000 Becquerels per liter of Beta-emitting activity. Cesium-134 was at 18 Bq/liter and Cesium-137 was at 54 Bq/liter, both below the national limit for release. The tank is located about 200 meters from the sea. The Hiroshima Syndrome’s Fukushima Commentary is proudly hosting the 176th edition of the Carnival of Nuclear Energy Bloggers. For the full reports, please click on the individual links. Blog topics for this edition include – making science-based communications effective, how too-low exposure limits hurt Japan, JFK’s Best-of-the-Above speech revisited, Germany’s rising electricity expenditures, the costs of building new nukes, and much more.